How is knowledge of the external world possible? How is knowledge of other minds possible? How is a priori knowledge possible? These are all examples of how-possible questions in epistemology. 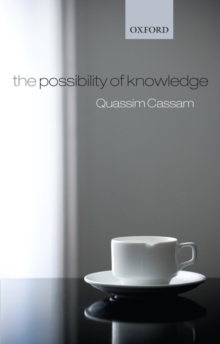 Quassim Cassam explains how such questions arise and how they should be answered. In general, we ask how knowledge, or knowledge of some specific kind, is possible when we encounter obstacles to its existence or acquisition. So the question is: how is knowledge possible given the various factors that make it look impossible? A satisfactory answer to such a question will therefore need to do several different things. In essence, explaining how a particular kind of knowledge is possible is a matter of identifying ways of acquiring it, overcoming or dissipating obstacles to itsacquisition, and figuring out what makes it possible to acquire it. To respond to a how-possible question in this way is to go in for what might be called a 'multi-levels' approach. The aim of this book is to develop and defend this approach. The first two chapters bring out its advantages and explain why it works better than more familiar 'transcendental' approaches to explaining how knowledge is possible. The remaining chapters use the multi-levels framework to explain how perceptual knowledge is possible, how it is possible to know of the existence of mindsother than one's own and how a priori knowledge is possible.